Mary-Anne is a Canadian Author whose first book was released on October 9, 2015 by New York, NY based publisher Library Tales Publishing. We are all Mediums, fully capable of learning to bridge the gap between this world and the next. Just like any other skill or ability, connecting with the other side can be taught, learned, and mastered. 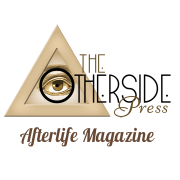 This extraordinary book is a unique guide that takes readers on a captivating journey from the beginnings of a spiritual practice to communicating with the dearly departed. 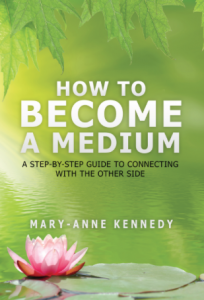 Throughout the book, Mary-Anne explains how the process of mediumship works, and illustrates a critical path to follow, full of specific exercises and other indispensable learning tools, helping to guide you every step of the way. Mary-Anne shares her personal experiences with grief, fear, and anxiety, and talks about how instrumental learning to meditate and learning to speak with spirit were in her own healing. Through examples of her own mediumship practice, she also enlightens readers with messages from heaven about love, forgiveness, healing, and moving on with our lives here in the physical world. ORDER YOUR COPY ON AMAZON.CA! To pick up a copy locally, please visit Booklore in Orangeville, Ontario, or Breakthrough Centre in Brampton, Ontario. 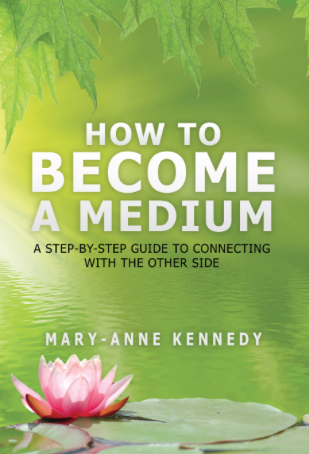 Mary-Anne regularly participates in book signing events, including three in 2015 at Chapters-Indigo, Breakthrough Metaphysical Centre, and Grace Tipling Theatre. If you would like to host a book signing event with Mary-Anne, please inquire HERE. Are All Professional Mediums the Real Deal? If you would like Mary-Anne to write for your publication, please contact her office HERE.